(1) All in SS#400 or #300. 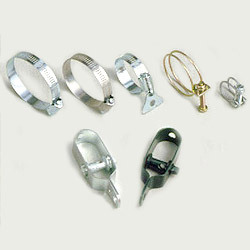 (2) Housing & band: SS #400 or SS#300, screw: steel. (3) Band: #410 SS, housing and screw: steel. 2. All in galvanized steel. Band width: 8.0m / M-HF-2101, 9.0m / M: HF-2907, 12.7mm / HF-2202(T:0.6mm) / HF-2203 (T:0.6mm).